The art of home now shines in the kitchen, with the introduction of India. One graceful line is the hallmark of this new piece that's the very first of its kind never before has a faucet handle been integrated into the whole to create a single, fluid form. Everything about India functions from within this unique and innovative design, from the dual-function pull-down spray head to the ergonomic yet oh-so-elegantly integrated handle. So that all you see is beauty, and all you feel is quality. India by Pfister, for the art of your kitchen. Substance meets style in the Kraus kitchen faucet collection. With a streamlined design and flexible functionality, this single lever pull-down faucet is the perfect fit for your kitchen. Every Kraus faucet is constructed with top-quality components, including a water-efficient flow-optimizing Neoperl aerator and a precision Kerox ceramic cartridge for reliable drip-free use. This model features an ergonomic pull-down spray head and single-lever handle for effortless temperature and flow control. The dual-function sprayer with flexible smooth-retract hose switches between aerated stream and powerful spray. With a high-arch design for versatile style, this faucet is at home in any kitchen. Clean, sleek lines create a beautifully balanced silhouette that suits a range of design styles, from traditional to transitional to modern. Customize the look even further by choosing from two distinctive finishes to coordinate with your kitchen decor. Indira Pulldown Kitchen Faucet in Stainless Steel The art of home now shines in the kitchen, with the introduction of India. One graceful line is the hallmark of this new piece that's the very first of its kind never before has a faucet handle been integrated into the whole to create a single, fluid form. Everything about India functions from within this unique and innovative design, from the dual-function pull-down spray head to the ergonomic yet oh-so-elegantly integrated handle. So that all you see is beauty, and all you feel is quality. India by Pfister, for the art of your kitchen. 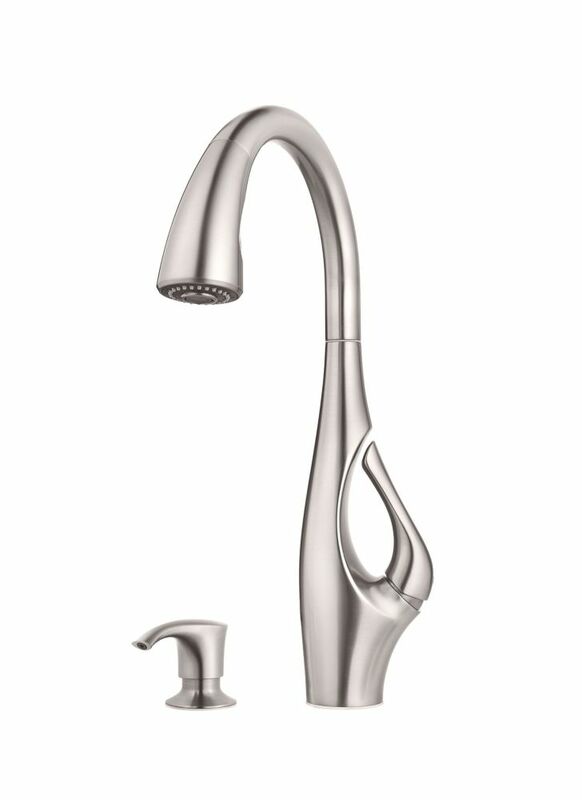 Indira Pulldown Kitchen Faucet in Stainless Steel is rated 3.5 out of 5 by 18. Rated 1 out of 5 by Dani1975 from Expensive, poor quality Installed less than a year ago, and now leaking worse than the faucett it replaced. I will not buy this brand again. I am furious. Rated 5 out of 5 by James from Great features. Sturdy construction. Elegant desig Contractor recommended Indira kitchen faucet because he said it's the best. Rated 1 out of 5 by Pelican1021 from Love the look but it's failed twice We have had two instances where the faucet leaks at the handle and floods our kitchen. We replaced the cartridge once when Pfister sent us a new one shortly after we bought it. Now 6 months later it's failed again. This morning we woke up to water all over our counter top which drained onto our wood floor. It's so maddening. Rated 5 out of 5 by fancy from faucet replacement I greatly appreciate your replacing the defective faucet. Just love it. Rated 4 out of 5 by K J from Nice Design Bought this for it's unique design. Overall quality is good but the sprayer hose is subject to leakage due to the cheap material used for the flex hose...unacceptable given the price of the product. However Pfister does replace this type of item under the lifetime warranty. Rated 3 out of 5 by surfkook from Leaking hose I love the design but after 18 months the flimsy black hose leaked and flooded my kitchen. Pfister took care of it but now I’m nervous about it happening again. Rated 5 out of 5 by Daisy from Love this Faucet We recently remodeled our kitchen and needed an additional part to install our kitchen faucet with our new granite countertop. I was pleasantly surprised that it was under warranty and they shipped it out directly to our home. Rated 4 out of 5 by Carlos from Beautiful faucet I bought a year ago! Works well and beautiful style.